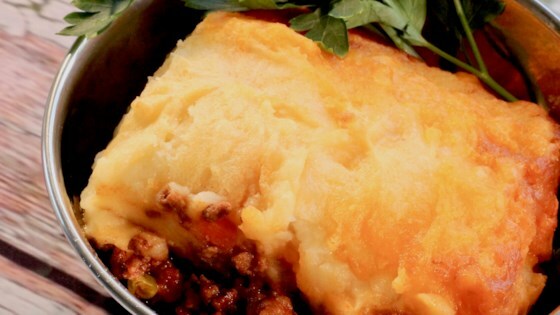 "This is my version of a classic English cottage pie - the comforting dish that we all love! [Recipe originally submitted to Allrecipes.co.uk]"
Heat oil in a pan over medium heat. Add onions, garlic, and beef. Cook and stir until beef is browned and crumbly, 5 to 7 minutes. Add stock, peas, carrots, tomato paste, parsley, salt, and pepper. Reduce heat and cover. Simmer until carrots are tender, about 20 minutes. While beef mixture is cooking, place potatoes into a large pot and cover with salted water. Bring to a boil. Reduce heat to medium-low and simmer until tender, about 20 minutes. Drain. Add Cheddar cheese and butter to the pot and mash together with the potatoes. Spoon beef mixture into a baking dish. Top with potato-cheese mash. Bake in the preheated oven until golden brown on top, about 30 minutes. Traditional take on a mince-meat pie. This cottage pie freezes well; assemble the pie and freeze before baking. Once you're ready to bake, simply throw it in the oven straight from the freezer.